The responsibility for obtaining MRI accreditation usually falls on the chief technologist or the director of diagnostic imaging. Technical aspects of the application process seem complicated, and a facility’s staff must rely heavily on an MRI scientist or a qualified medical physicist. But here’s help: a step-by-step pathway to accreditation with concrete suggestions about how to avoid failure. Over the past 12 years, the American College of Radiology (ACR) MRI Accreditation Program has helped improve the quality of MRI exams. Few would disagree that the program has encouraged the use of better equipment, promoted higher standards, and pressed for better MRI services. It has become the most recognized and respected source for MRI accreditation. At present, about two thirds of the estimated 9,000 MRI units in the United States are either ACR accredited or in the process of becoming such. ACR phantoms are in use in many countries, including South Korea, Belgium, Canada, Australia, and Germany, assisting local quality control and accreditation programs. The accreditation requirements can also help develop more confident and knowledgeable staff, reduce downtime, improve the efficiency of imaging services, and increase community respect for your facility. The kingpin. This is probably you, the person tasked with the job. Without any doubt, this is the most important person in the accreditation process, the one who must coordinate the effort. Just as in mechanical systems, the kingpin ensures that all the separate pieces work together as planned. Without such a person, the project will probably languish. The radiologist. Inadequate clinical studies represent the most common source of failure. The radiologist selects the clinical cases for submission. For the full body program, the ACR requires each applicant to submit an exam of the brain, C-spine, L-spine, and knee. These exams should demonstrate your standard scan techniques and do not have to include pathology. It’s important to note that the ACR has requirements for in-plane resolution and slice thickness (www.acr.org/accreditation/mri/mri_qc_forms/mri_testing_instructions.aspx, page 6). Remember, in-plane resolution is the field of view divided by the acquisition matrix. (For example, if you use an 18-centimeter field of view, you will have phase and frequency matrices of at least 240 to meet this requirement.) The radiologist also provides information on the peer-review process used at your facility and approves information as needed on code and other emergency procedures. The physics expert. While most sites have excellent radiologists, the quality of MRI physics assistance appears to vary substantially. Some know MRI well and have experience, while others may have only a few hours of training, if any, in the technology. The physics expert is critical to the accreditation/quality control effort. Many sites fail due to inadequate or improperly conducted phantom scans. The physics expert provides the annual performance testing on your equipment, assists you in setting up and monitoring the weekly on-site quality control program, and is available to answer technical questions. This person needs to be knowledgeable about the ACR process, help you with your questions and, in the unlikely event you fail the technical portion of the process, help you evaluate the problems and develop solutions. 1. System operation. Your physics expert should be able to run the MRI with little or no assistance. After all, would you trust your car to a mechanic who couldn’t drive it? This is not to say that local staff or service should be excluded, but testing should not be dependent on them. The purpose of the annual ACR MRI performance review is to provide an unbiased check of the technical aspects of your system, especially how it compares with similar units. The reviewer should be a neutral party who conducts testing and reports honestly without fear of reprisal or expectation of undue reward. Further, you are paying your physics expert for an independent evaluation, not just a rubber stamp on the vendor’s testing report. 2. Experience. Ask the potential physics expert how many ACR annual tests he or she has done on MRI units like yours and when the last one was. Inquire about their experience setting up and reviewing MRI quality control programs. If answered honestly and completely, the responses should provide you with a picture of the physics expert’s experience with your system. • Homogeneity testing: Homogeneity is the purity, or constancy, of the main magnetic field. If it is poorer than normal, some aspects of imaging may be impacted, such as the quality of frequency-selective fat-saturation pulse or signal-to-noise ratio. The annual MRI technical review should include not only the results of testing but also a description of the method used and the data produced. • Monitor luminance review: The amount of light that your MRI monitor puts out may impact your ability to see and possibly differentiate structures. Annual testing should determine if it is too dim or if the contrast is not set properly. This is done using a special test pattern and a luminance meter. Results should include high and low luminance values in the four corners and the middle, as well as an assessment of contrast, geometric distortion, and resolution. • Specialty coil testing: The ACR requires an annual review of all specialty coils used clinically, and the report must include the model and serial number for each coil. For surface coils, testing must include signal-to-noise ratio and an evaluation of the signal pattern. 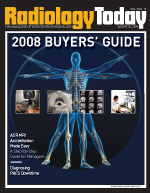 For volume coils (typically, those that surround the anatomy like head, knee, wrist, etc), testing must address signal-to-noise ratio, imaging intensity uniformity, and the ghosting ratio for each coil. The report should include a description of phantom setup and testing method for each coil, as well as the numeric results. I strongly recommend having your team in place before beginning the actual accreditation process. This way, you will have experts available to answer questions as they arise, saving you time and stress. The ACR now offers two mechanisms for application, the standard paper forms (www.acr.org/accreditation/mri/mri_qc_forms.aspx) or online (www.acr.org/accreditation/mri.aspx). Personally, I find the online method to be convenient, but it is currently only available to new applicants. Open an account and fill in the information that you have at the time. The next time you log into the account, you can edit your entries. There is no cost for either method until you actually submit the application. You can save time by downloading and printing a copy of the online application overview to help guide you in the collection of required information. Parts of the application refer to peer review and the date of your system’s most recent technical review (physics test). Take questions on peer review to your radiologists or other physicians at your site responsible for clinical interpretation. Issues on instrument testing can be addressed by a physics expert who conducts your annual MRI performance testing and assists with your local quality control program. Please note that the ACR will not accept an application without proof of a physics expert’s report on your system dated within 12 months of submission. Once your application is accepted by the ACR, they will send you a packet of information, a group of forms, a copy of the ACR MRI quality control manual, and an MRAP number. The clock starts at this point. You have 45 days to complete your submission and return it to the ACR. Contact the manufacturer of the ACR MRI phantom and order one as soon as possible. This information is in the ACR packet or on the ACR Web site, and you will need your MRAP number to place the order. Phantoms are subject to periodic shortages due to the requirements of the manufacturing process, so don’t delay contacting the phantom vendor. Many people feel that quality control and equipment testing are giant pains in the gluteus maximus. The weekly quality control program should not take more than about 15 minutes, and an annual performance review can be done outside normal scan hours. In my own MRI testing, I’ve found bad head and body coils, lousy homogeneity, faulty gradient amplifiers, intermittent radiofrequency systems, monitors that don’t meet specifications, and a host of other problems. Statistically, I find something wrong in about 80% of the systems I test. What amazes me the most is that these units were certified for patient use, and the owners were paying service contracts to keep them performing properly. Independent annual testing and on-site quality control can help to identify issues before they become catastrophic problems. Most new sites—and numerous previously accredited sites—have not properly maintained their quality control programs and have not had their systems tested. If that’s your facility’s situation, contact your physics expert. His or her job is to provide a thorough, independent review of your MRI equipment and identify issues that may need attention from service or from staff. Since the ACR will not accept an application without proof of a physics expert’s report on your system dated within 12 months of submission, plan ahead to ensure this is done before your 45-day clock expires. 1. Five scans. Once the ACR phantom arrives, you can begin your weekly quality control program and also generate the five required phantom scans for submission. The ACR phantom is a plastic cylinder filled with water, salt, and a bit of pixy dust (actually nickel chloride). The phantom has “head” and “chin” engraved on it to show its proper orientation to the head coil, and it should be placed on a pad to minimize vibration and to help in leveling. Your physics expert should show you how to set up the phantom. ACR has two excellent guides to phantom setup and evaluation (www.acr.org/accreditation/mri/mri_qc_forms/phantom_test_guidance.aspx and www.acr.org/accreditation/mri/mri_qc_forms/site_scanning_instructions_phantom.aspx). It is vital for any technologist new to the ACR program to read these documents. They show what each of the images should look like and how the ACR reviewer will examine them. Before sending in your phantom images, ask your physics expert to review them with respect to the ACR’s criteria for passing. Your submission must contain five phantom studies, described fully in the Web references above. The first is a sagittal slice through the center that is used for head-foot distance accuracy and for locating the remaining studies. There is an 11-slice, T1-weighted series that’s used to check geometric distortion, ghosting, resolution, slice thickness, landmark accuracy, image intensity uniformity, and low-density contrast detectability. The T2-weighted ACR series also examines slice thickness, landmark accuracy, imaging intensity uniformity, and low-density contrast detectability. In addition, the ACR also requires applicants to submit phantom studies using the site’s standard brain T1- and T2-weighted protocols. These are modified to use 11 slices of 5-millimeter thickness. Reviewers also consider these exams for slice thickness, resolution, and low-density contrast detectability. If your site uses an eight-channel head coil, make sure to employ the normal artifact correction software provided by your vendor that you use on your clinical exams. Many eight-channel head coils fail portions of the technical testing without this image correction software. 2. Check your work before submitting phantom studies. Double check that the clinical exams meet the ACR requirements for resolution and slice thickness. Using the instructions detailed in the ACR phantom guide, examine each of your five phantom series according to the test criteria. This is not complicated, but ask your physics expert if you have questions or get him or her to do it for you. If you verify that your clinical and your phantom studies are good, it is unlikely that your submission will be rejected. 1. Getting the news from the ACR. It’s most probable that you will get a letter from the ACR noting your successful accreditation for a period of three years. Raise a glass of your favorite beverage, congratulate your team, and proudly post your new ACR certificate. 2. What if you fail? If you receive a notice of failure, don’t panic. First, read it carefully to understand the reasons why accreditation was not granted. This is likely to be in only one of the two review areas: clinical or technical. If the failure is due to a clinical issue, discuss the results with your physicians. If one or more of your submitted studies do not meet ACR resolution and/or slice thickness minimums, you will need to change your protocols and resubmit the new studies (extra fee for resubmission). If the failure is due to the reviewer’s general rejection of your protocols and your physicians feel your methods are adequate, appeal the rejection. Have your physicians author a letter to the ACR explaining the situation and why their protocols should be allowed. You can also request that a second reviewer consider the appeal to guarantee objectivity. If you win your appeal, accreditation will be granted. If you lose, you have the choice to change your protocols and resubmit. If the failure was of a technical nature, contact your physics expert immediately. He or she can help to explain the reasons for rejection and should assist in a strategy to correct the problems. If the rejection is due to legitimate problems, correct them and resubmit. If the rejection is not consistent with the information you have submitted, appeal the findings and ask for a second review. Have your physics expert assist you with authoring a letter that points out the reasons why the rejection does not appear to follow ACR guidelines and why your data support passing. If the appeal is granted, toast your success. If it is rejected, rescan the phantom studies, check your results, and resubmit. Step 7 — We’re Accredited, Now What? ACR accreditation is granted for a period of three years. During this time, sites are required to conduct weekly quality control, visual checklist, and film densitometry. Annual performance testing is also mandatory. The records of these studies must be available at the site in the event ACR personnel make an unannounced visit. I know of sites where ACR has made such visits, so be prepared. Work with your physics expert to ensure that your staff members are conducting exams properly and they understand the reasons for these efforts. Teach the attitude that such programs demonstrate your excellence and will help find problems as early as possible. 1. Quality control. The ACR requires accredited sites to maintain a weekly quality control program consisting of three sections. Results must be recorded and available to your physics expert for review during the annual MRI performance testing. Forms for each are found at the end of the technologist’s section of the ACR’s MRI quality control manual or on the ACR Web site. You will also have to demonstrate compliance with this requirement to become recertified. Weekly phantom studies must be done and results assessed against action limits. The process takes approximately five to 10 minutes. Action limits should be set up initially by your physics expert as a part of the annual ACR MRI performance testing. Once a week, your technologists must review the condition of your MRI system and environment. This takes about three minutes. If you print film, you must print the Society of Motion Picture and Television Engineers test pattern once a week and assess optical densities for the 0%, 10%, 40%, and 100% gray-scale levels using a transmission densitometer. Those of you participating in a mammography master of science in quality assurance program will be familiar with this testing. It verifies consistency in filming and takes about five minutes. If you do not have a camera connected to your MRI, you can opt out of this requirement by signing an attestation, which is available on the ACR Web site forms section (Laser_Attestation.aspx). • MRI accreditation requires it. If you now have or anticipate getting ACR MRI accreditation, quality control and annual testing are required. You cannot get accredited or reaccredited from the ACR without proof of in-house quality control and annual testing. • It helps avoid catastrophic failure. Quality control can help spot changes in system performance before catastrophic failure or substantial loss of image quality. This can minimize loss of scan time by alerting service to correct the problem promptly. Further, it can help eliminate the equipment, in some cases, as the source of a particular problem. • It’s a thorough systems check. Annual testing and quality control can identify problems with system components that may not get regular vendor testing. Some examples include poorly performing specialty coils, monitors that do not meet specifications, substandard magnet homogeneity, geometric distortion, miscalibrated laser cameras, and ghosting artifacts. — Robert A. Bell, PhD, is an independent consultant and the president of R. A. Bell & Associates based in Encinitas, Calif.